God’s own place ‘Kerala’, situated in the Southernmost part of India, is mostly known for its lush green atmosphere, pious Onam celebration, soft spoken people and amazing scenic beauty. People from all over the World know about its snake boats and boat races and from various part of the world people come to watch this beautiful combination of art and culture merging with awesome scenic beauty. But this time, it was not about just scenery that Kerala has attracted importance of Asia. This time, one inhabitant of this beautiful place, created something with a motive to beautify the coconut tree filled Indian state with something more interesting. He created a neck tie for a commercial building. 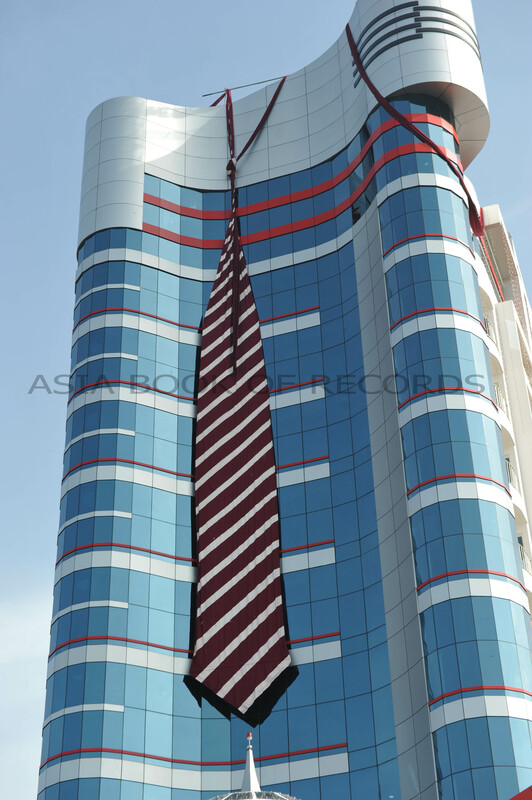 Asia Book of Records reached Kerala, India on July 13, 2012 amidst the hilly streets and greenery, just to have a glimpse of the longest tie ever made and to be simultaneously hung on a commercial building. Everyone has seen a neck tie in their day to day life. It is one that piece of ornamental clothing which shows nothing or hides nothing, but definitely does add a star to our look. In schools, we wear it as a compulsory part of our uniform, and in the corporate life, it is a compulsory part of a decent formal look. If added to a casual look, the neck tie goes amazingly well. The normal usage of a neck tie is only for humans to look good in, but never heard of or seen a neck tie designed especially for a huge lifeless commercial building. Mohammad Ali P. of Perinthalmanna, Kerala, India, thought of making the inauguration of his wedding castle ‘HITEX WEDDING CASTLE’ a memorable one. The resultant thought made him to create a tie of length 34.12 meters from the knot. As if this amazing length was not enough, he thought of hanging it on the top of his HITON commercial building for people to view and become awestruck by looking at it. The location was Perinthalmanna; sub-urban of Kerala. It was yet another out-of- the-box creation which would never have been possible without the supporting hands of the event management and promotions company ‘Colors and Concepts’ and it vivacious team, who were all indulged into making the event and the tie a mega hit. As the tie would become impossible to be measured once it is hung, so, Asia Book of Records adjudicator along with Mr. Anil J. Philips of Colors and Concepts, went at a very odd hour of 11pm of July 13, 2012 to Mr. Mohammad Ali’s luxurious house and then take the measurements of the complete tie. The total length of the cloth used in creating the massive neck tie was a breathtaking 149.71m. The venue for the 2-day stay was the Heritage Hotel, which was a beauty in its own place. It was like a palace where we were roaming around like the prince and princess. 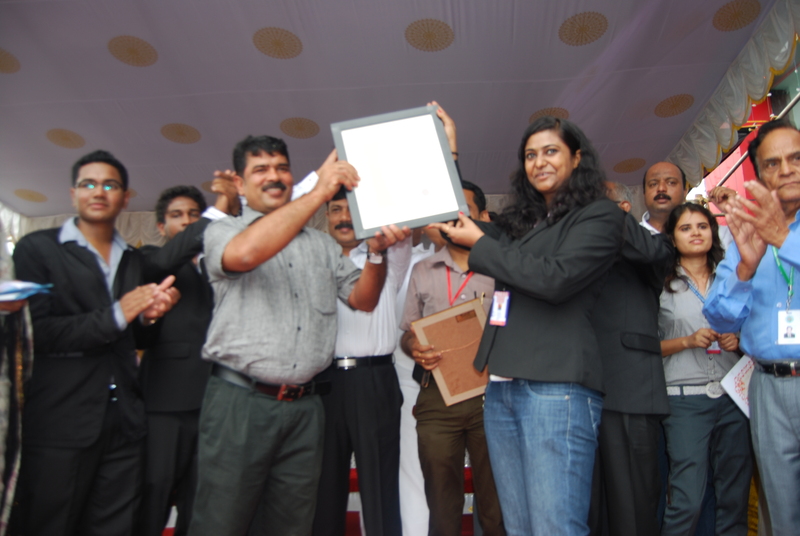 The next day, on July 14, 2012, when we reached the venue, the tie was already on the top of the enormous building and was inaugurated in the presence of a loud, happy and a crazy crowd and famous Malayalam (language of Kerala) film star Suresh Gopi. In all, the whole experience was beautiful and a memorable one. 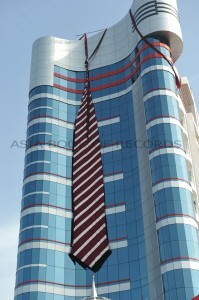 Asia Book of Records had a proud experience in watching such a unique and a daring attempt. Never had anyone tried to make a commercial building look so corporate and formal. Salutes to Mr. Mohammad Ali for making the huge effort and also to Colors and Concepts team, to have pulled out the complete daring feat to a successful level. Comments for TIE LONGEST TIE SUSPENDED FROM A COMMERCIAL BUILDING are now closed.